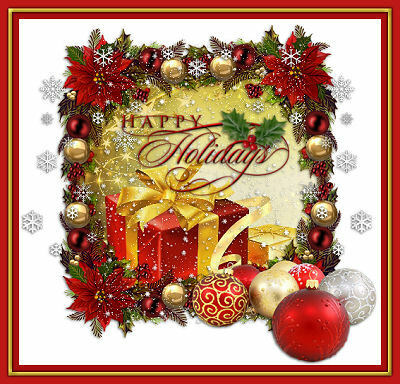 No matter what you celebrate hope you have a good one! Holiday Dolls and Tatted Jewelry up at Ebay! I've been listing more Items at Ebay. Have a look for these rings made using a free pattern by a very talented tatter , yarnplayer. Look for her things at etsy using that name! 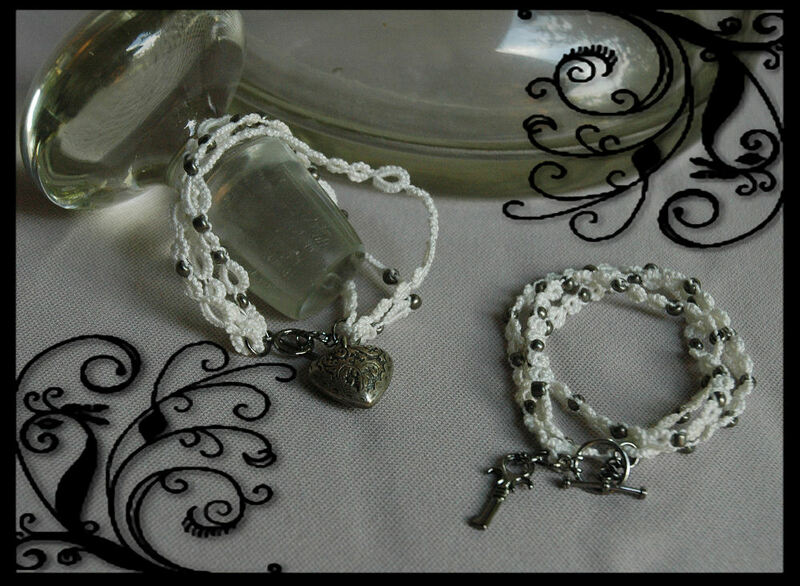 I've also listed some bracelets. There are my own design. 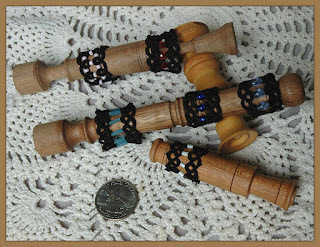 Basically there are pieces of trims, some with beads some without attached to metal findings. Shuttles and Christmas Dolls at Ebay! I've never listed any of my decorated shuttles at ebay before as auctions but I decided to try these 3. 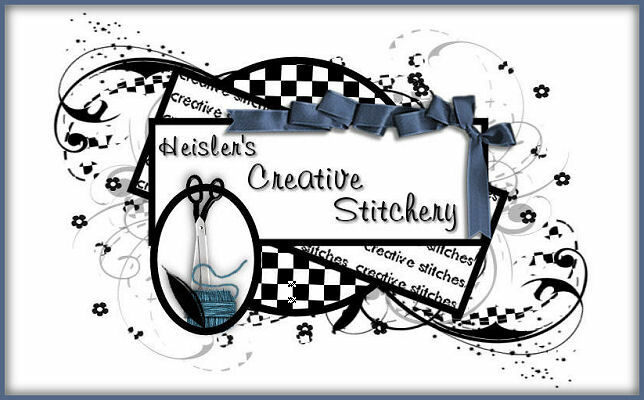 Go to ebay and search for seller creativestitches to find what I have for sale. I've never made a heart pocket bag before and probably won't again. I couldn't get the doll pics to upload right so please go to ebay or you can find their pics at my Facebook page. 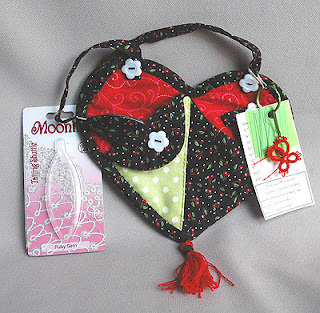 Just wanted to do a quick post to let you know that I've been listing Moonlit and Starlit shuttles I've decorated, some with matching bags, at my Etsy store.The pic above is one of them. 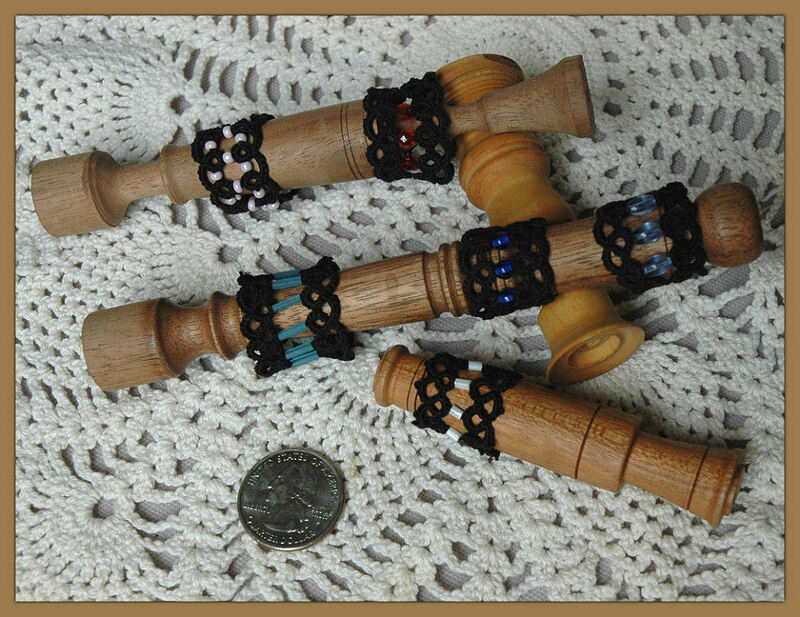 See the links in the right or left columns for my Etsy store. I also have 3 more I'm thinking about putting up at ebay as auctions. 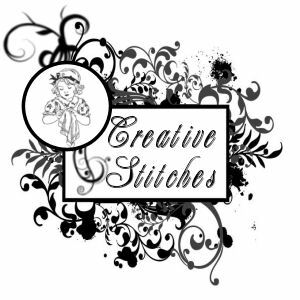 My ebay seller name is creativetitches. Use it to search for things I"m seeing there. I've been working on the blog this past week adding pages and new graphics. I've changed the red for blue and bordered posts. The page tabs are new, too. Now instead of going to one of the web sites you can just look at the links here. 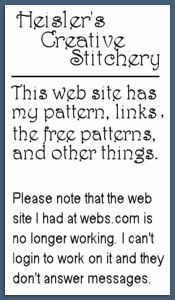 Look to the right of the page for links to my stores, places that sell my patterns, galleries, and more. The link to the search, translate, and blog archive are on this side, too. Look to the left for the links to my mirror web sites, a quick link to my etsy store, a featured post, and blog labels to make searching the blog easier. I finally finished a new crochet pattern. It's similar to the lucky penny crocheted shamrock I designed but this one is perfect for brides. I designed this flower to hold a coin for brides who wear sandals or other shoes that can’t hold a lucky coin. Think how special it would be to make one for a bride with 2 pennies in it. One with her birth year and one with the grooms. Or how about the year they met or got engaged and the year of the wedding. Make them with wedding year pennies for gifts to give to the Moms and Bridesmaids. You could also make them for shower favors. There are plenty of photos and I even include directions on cleaning the coins. I've kept the price low because I'm only selling it as a PDF, meaning you have to download it and print it yourself. Right now it's only at Etsy but as soon as I start selling at ebay again I'll list it. I took the summer off from selling at ebay but I'll be getting things back up there this week. Another New Pattern Up for Sale! This new pattern was done as an update to my old mermaids and shells pattern. This doll is slightly bigger. Audrina is 16" from the top of her hair to the tips of her tail. The really big change is her hair. It's mohair that's been cut from the skin. I bought mine at Ebay but Etsy as well as other online places sell it. 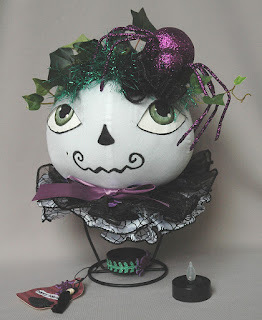 There are a lot of tips and color photos, along with step-by-step instructions and drawings to help you make her. 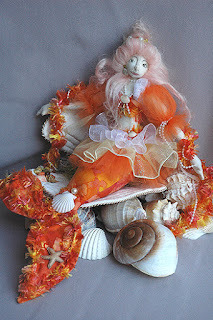 I like her made in the orange batik for a goldfish look. 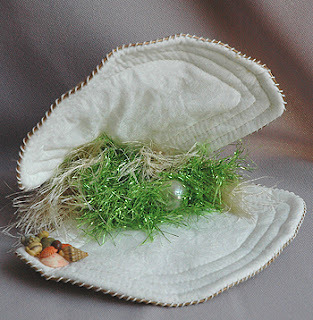 This is what the clamshell looks like. Fun wire is hand sewn along the edge so it can be shaped. Fun wire is also sewn to the tail for the same reason. 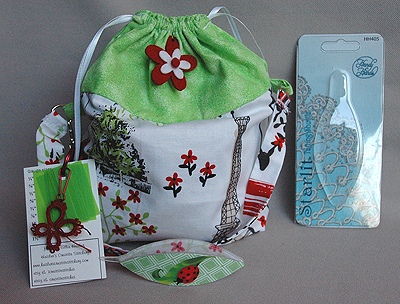 Look for Audrina and her seashell at my Etsy store and at Patternmart as Pdfs and printed patterns. At Ebay I'm only selling printed patterns but would put up a listing for a PDF if asked. At Patternspot only PDFs are available. If you have any questions please contact me thru Etsy or Ebay. New Crochet Pattern up for Sale! I know it's been months since I last posted anything. I've had a really bad year so far allergy wise. It seems like I just start to feel better and I get the flu, or a cold, or worse allergy symptoms. Thanks to being so tired from being sick and the meds not much has been happening. 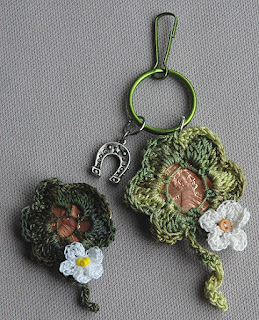 I did do a new crochet patterns for the shamrocks you see in the pic. 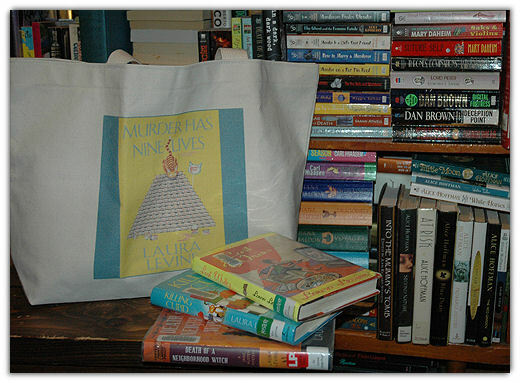 It's listed at my Etsy store as a PDF file only. I've let the stuff at ebay expire since I'm so brain fogged from meds to trust myself to list and relist there. The shamrock is easy to make and a cute gift to give with a lucky penny in it.Think about making them for shower gifts with a penny in the year of the shower! Ok, you may wonder why only a PDF version of the pattern? It's because I used a lot of photos and I wanted to keep the price low. To print it I'd have to up the price. You do need to know how to crochet as I don't give those kind of directions. 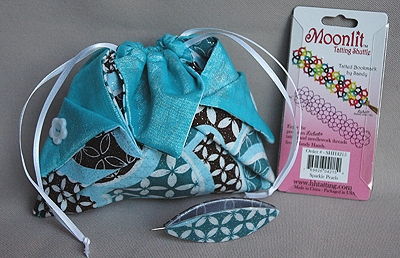 Next up, the new mermaid pattern. Cover photos have been ordered at Snapfish and received, and the directions just need another edit to check for mistakes. 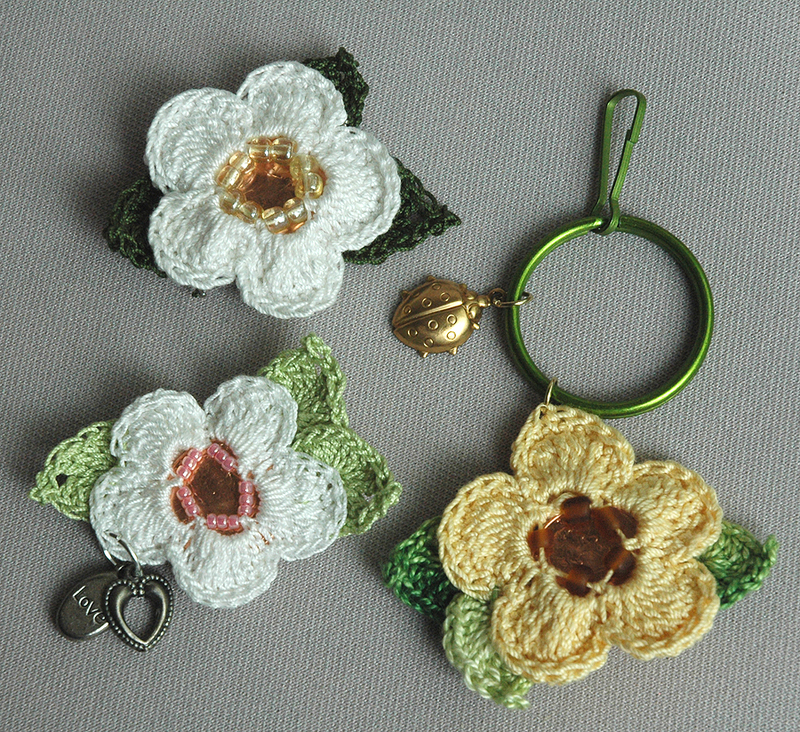 Oh, and a flower version of the penny holder is coming, too! 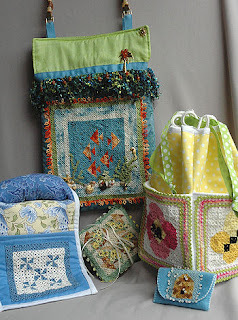 A Season of Mini Quilts - Summer is ready for sale! Yay! I finally finished the Summer tatting pattern. I still have to order photos for printed versions but you can buy the PDFs at my Etsy store and at ebay right now. As always you get the color charts for each tatted project and the directions for the finished projects. This PDF is the largest of al the patterns so it may take a while to download. Think about it, for only $12 you get the tatting patterns plus the hows for making the 2 tote bags, the sewing caddy, the small pillow, and the felt card holder. You'd probably pay about that much for a pattern for the sewing caddy or the bucket tote. 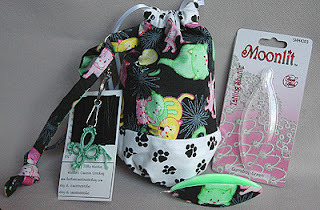 So even if you aren't a tatter you could buy it for the sewing patterns. To wish you a happy 2016 I put free PDFs of 2 calendars at my web site. One is 1 page of the entire year and the other is 12 pages with 1 month per page.